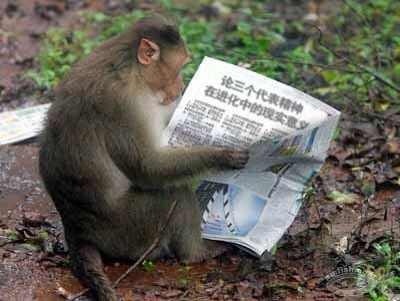 The monkey is reading about the “three represents“, a direct dig at former General Party Secretary Jiang Zemin. And, if weixin memes are to be believed — if not totally, perhaps partially — then current General Party Secretary Xi Jinping is targeting neibu, or inner circle folks. In fact, online Xi Jinping’s talks are repeatedly characterized as “strict (严厉)”. The adjective, of course, emphasizes the current administration’s explicit task to broaden reforms. In the aftermath of mixed messages, we’re still trying to figure out what that means. A larger political role for civil society and public debate? Or are we simply talking about a new purge? Excerpts of “strict” talking suggest the both/ and muddling of the current political landscape. Of note? The ongoing use of classical CCP rhetoric to make veiled attacks on opponents. There’s a fight going on, but who’s the actual target? Also of note, The fact that the “Talk on the meeting about development work” took place in September, but the memes are still circulating. I received these memes yesterday. Today some people are using reform like a tiger skin, [frightening] the people so they don’t speak or make judgments. In my opinion, this is using reform for anti-reform purposes. We’re not not reforming, we’re actually reforming, actually satisfying the people, pursuing a reform that will increase and further reforms. And what has been the status of reform these past years? Handcuffing productive capacities, perverted models of economic development, and serious environmental problems; we’re killing the goose [reform] that lays golden eggs. The gap between the rich and poor is too wide. This is not only a problem of individual abilities, but also a result of unequal access to opportunity and power. All along we’ve been saying that we want to empower society, that we want to liberate productive capacity, that we want to realize sustainable development and a stable society, but we haven’t done anything because within the Party there are small mafias (的利益集团的黑手) who benefit too much from the current situation. Is a tiger willing to spit out the meat in its mouth? All that can be done is fight the tiger. 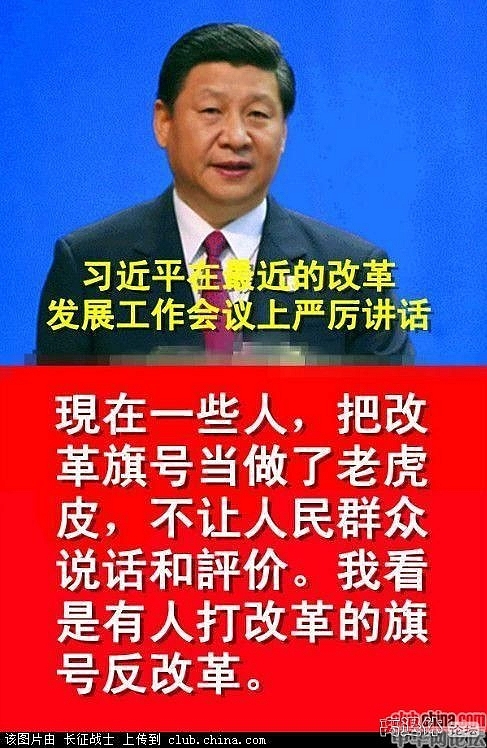 There are many such memes and, whatever the actuall status of Xi Jinping’s reform efforts, the memes resonate. What’s more, the memes are online, which means they have tacit support from the Center. Have we truly entered virtual political world of “monkey see, monkey reform”? This entry was posted in noted and tagged exegesis, General Party Secretary Jiang Zemin, political culture, political satire, text message, translation, xi jinping. Bookmark the permalink.